On other sites I see buttons/tabs for Newest, Frequent, Votes, Active, and Unanswered. I thought I used to see similar on EL&U also. Now I see only Active, Featured, Hot, Week, and Month. What gives me what I used to get with Newest? Updating this with a related question (well - really the same underlying question): How can I get Stack*, and specifically EL&U, to take me to Questions > Newest by default, whenever I choose EL&U (main or meta) from the A list of all 174 Stack Exchange sites drop-down menu? (You know - the one at the far right, which looks more like a hamburger menu than the officially knighted hamburger menu at the far left)? 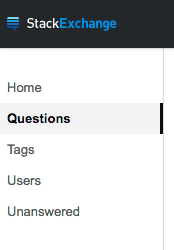 I do not want such menu items taking me systematically to Top questions, which doesn't even show me a tab for Newest. I want to go to newest questions. I'm willing to configure this for myself, if easy, and if I don't have to do it separately for each of the 174 sites or whatever. Hopefully I'm just missing something simple - something that would be obvious to a guru UX designer, but is not obvious to this ordinary user. If you don't see this sidebar there will be a hamburger menu (☰) in the top left corner that you need to click to show it. By the way, the navigation works this same way on all sites in the network. They changed the design to make it more unified and maintainable across the network and the reason they decided to switch to a left sidebar specifically is because of Stack Overflow for Teams. Not the answer you're looking for? Browse other questions tagged discussion support design .